Do you know when it's best to use a small, portable room air conditioner unit to keep cool indoors compared to using a whole house AC system or HVAC? It's not always so beneficial or economical to opt for one or the other depending on who is occupying the house at any given time, as I will endeavor to explain in this article. It is true that a portable AC unit is one of the better investments for your home that you could make. Especially if where you live has hot summers, or if you live in a place that enjoys a very hot climate for a large part, if not all of the year. You surely already know what a pleasure it can be to sit in comfort in a room with a pleasant temperature at level many degrees less than the blistering outside heat. It's also good to know that you're not wasting large amounts of precious power to cool your entire house, especially when you could be occupying just one room at a time! Sure, for families whose members are likely to be occupying different rooms in the house then a whole house air conditioning system can be a wiser choice, but for people who live alone, or even for couples living together who want to keep their power bills to an affordable level, a single room portable air conditioner is an intelligent choice. Let's look at why this is. There are several benefits associated with owning a portable air conditioner no vent or vented. Probably the most important of those is the fact that they can save you a lot of money both in the short term and also in the long term. In the short term, the savings are obviously in the installation costs. For whole house air conditioning or installations where individual units are installed in each room of the house the initial costs are very high. This is due the fact that several units need to be installed with their corresponding outside units for expelling the hot air. A single unit is only a fraction of that cost to buy. In the long term the savings are on power consumption. 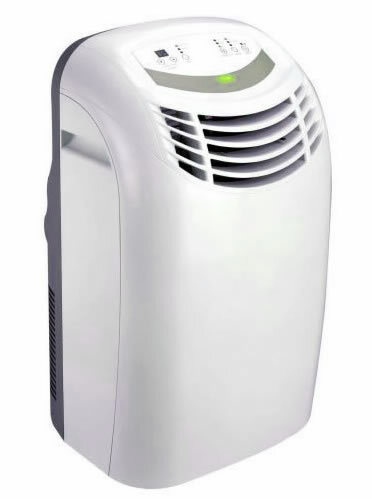 While a comparable portable room air conditioner can use slightly more power than a dedicated room unit, this is not always the case and moreover, only one unit is running. When you have several fixed units in various rooms in the house, the temptation is to leave some or even all of them running so that should you or another family member decide to move from room to room, then they will always enter a nice cool room. What happens in reality in this situation is that all these units are left running while nobody uses the rooms, so all that power is wasted. That power has to be paid for and that's when you receive the coronary inducing quarterly utility bill for your crazy electricity consumption. Its a stupid mistake you only make once. With a single portable unit, this cannot happen. That's because you only have the one unit that is ever running. It keeps the room that you are occupying cool, which means you are only using electricity to run the one unit. I think you can see where the vast saving in power consumption lies! The sensible way to get the best use from a portable air cooling device is to set the unit's thermostat to a comfortable setting. That's so that you don't end up with a room that feels like the inside of a walk-in meat freezer! After all, you want a room temperature that is comfortable to be in, and that is generally around 72 degrees Fahrenheit (25ºC) give or take a couple of degrees for individual preferences. To achieve that temperature, any air conditioning unit does not have to work so hard, and therefore will not use so much power to do so. If there are several members to a household, the problem will arise where different people will want to occupy different rooms at the same time. This can be fixed by having more than one portable air conditioner unit that can be placed in different rooms. However, if the need is for more than three or four units, then it can be a more sensible option to have whole house air conditioning fitted as this will use less power. But where there are only one, two or three members of a household, portable air coolers are definitely the way to keep the power utility bills to a sensible level. Some diligence is required to ensure that during the times you are all occupying the same room, say whilst watching TV in the family room, then only the one unit needs to be running. When you go to bed later, units can be moved into the necessary rooms (or a child's bedroom can have its own dedicated unit) and then left running on a very low thermostat power setting overnight, or even set on a timer to switch off after an hour or so by which time you'll be asleep and not need it! There are plenty of common sense options available to you when you make use of air conditioning in whichever form you decide to have in your home. As long as you exercise that common sense and only have units cooling rooms where there are people occupying them, then you will not waste so much power and be kinder to the environment while being kinder to your bank balance when the quarterly utility bill drops through the letterbox! If you want more information, especially on the portable ventless air conditioner type of air coolers that are available, please visit the page in that link. 1 thought on "When to Use a Portable Air Conditioner"
Thanks for the article, tremendous information. Now I better understand about non-fixed, free standing air conditioners. I was trying to figure it out lately until I found your blog and I’m glad I did.